For other people with the same name, see Pete Smith (disambiguation). 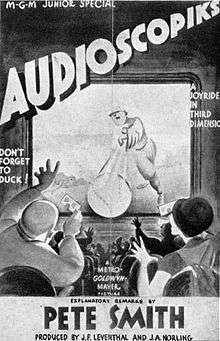 Pete Smith (September 4, 1892 – January 12, 1979) was an American publicist, short subject producer and narrator. A native of New York City, Smith began working as a publicist at Metro-Goldwyn-Mayer in the 1920s. He later moved into film making. He is best known for his series of shorts, the Pete Smith Specialties, which were in production from the 1930s to the 1950s. Smith produced and narrated over 150 shorts which earned him two Best Live Action Short Film Academy Awards. In 1953, he was awarded an Academy Honorary Award for his short films. Smith's later years were spent in a Santa Monica convalescent home due to ill health. In January 1979, Smith jumped to his death from the roof of the home. Smith was born Peter Schmidt in New York City. He began his career as an aide for a vaudeville performers union. Smith then worked as an editor and critic for a trade magazine before becoming a press agent. 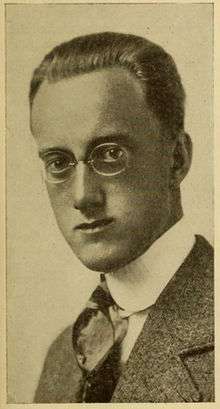 By 1915 he was doing movie publicity for Bosworth, Inc., followed by the Oliver Morosco Photoplay Co., Artcraft Pictures Corporation, and Famous Players-Lasky. He was one of the founding members of the Associated Motion Picture Advertisers. In 1925, Smith was hired as the head of publicity for Metro-Goldwyn-Mayer by Louis B. Mayer. He was later recruited to overdub the actions of trained dogs in the studio's Dogville Comedies. Smith would go on to narrate the studio's sports newsreels; he would embellish the action by running certain scenes in reverse, or adding his own commentary. Both MGM and the movie-going public picked up on Smith's flair for comedy, and he was given his own series, Pete Smith Specialties; he produced and narrated 150 short subjects for MGM from the 1930s to 1955. His distinctively sharp tenor voice and nasal tone were instantly recognizable and a trade-mark of the series. Most of Smith's films were comedy documentaries, typically one reel (9 to 11 minutes long). Short subjects in this era were part of the studios' exhibition packages, along with serials, animated cartoons, newsreels, travel documentaries, etc. Among the diverse topics Smith covered in his short films were Emily Post-style household hints, insect life seen through a microscope, military training and hardware (during World War II), and dancing lessons. There were even several "series-within-the-series", such as lighthearted general-knowledge quizzes, professional football highlights (in the days before widespread television), quirky looks at many different kinds of animals (for example, Donkey Baseball and Social Sea Lions), and "Goofy Movies" (playing antique silent dramas for laughs). Smith narrated a patriotic short for the U.S. Government, The Tree In a Test Tube (1943), filmed in color, featuring Laurel and Hardy in a demonstration of household wood products, with Smith explaining the various exhibits for the viewer. In the 1940s, movie stuntman and actor Dave O'Brien became the primary focus of Pete Smith Specialties. The hapless O'Brien would personify everyday nuisances: dealing with pests at the movies, demonstrating pet peeves, tackling hazardous home-improvement projects, and other problems with which the audience could identify. O'Brien's scenes were shot silent, compelling O'Brien to express his satisfaction or frustration entirely in visual terms as narrator Smith offered get-a-load-of-this commentary. O'Brien knew the format so well that he also directed many of the shorts, under the name "David Barclay." He staged many of the sight gags himself, taking stupendous pratfalls for the camera. Many of the laughs generated by the highly ironic voice-over narration were delivered by Smith himself. His somewhat nasal, matter-of-fact vocal style was imitated and parodied. Smith produced and narrated over 150 shorts which earned him fourteen Academy Award nominations and two Best Live Action Short Film Academy Awards. At the 26th Academy Awards, Smith was awarded an Academy Honorary Award "for his witty and pungent observations on the American scene in his series of Pete Smith Specialties." By 1954, Smith's shorts had declined in popularity and Smith announced his retirement that same year. The M-G-M unit that produced the Pete Smith Specialties closed down the following year. Smith married Marjorie Ganss in 1918. They had one son, Douglas, who later became a technician at RKO. Smith and Ganss remained married until her death in 1957. Smith's second marriage was to his secretary, Anne Dunston, whom he married in Las Vegas in October 1962. Smith spent his later years in poor health at a convalescent home in Santa Monica, California. On January 12, 1979, Smith committed suicide by leaping off the building's roof. Smith was survived by his second wife, Anne, and his son Douglas. For his contribution to the film industry, Pete Smith received a star on the Hollywood Walk of Fame, at 1621 Vine Street. 1 2 "Pete Smith". Hollywood Walk of Fame. Retrieved 2012-01-30. 1 2 "Pete Smith". Los Angeles Times. Retrieved 2012-01-30. 1 2 "Specialty producer dies at 86". The Leader-Post. January 16, 1979. p. 25. Retrieved January 13, 2013. ↑ "Pete Schmid". Moving Picture World, July 20, 1918. Retrieved 2012-08-02. ↑ "Movie Ad Men in Association". The Fourth Estate. August 5, 1916. Retrieved 2012-08-10. ↑ Zone, Ray (2007). Stereoscopic Cinema & the Origins of 3-D Film, 1838-1952. University Press of Kentucky. p. 147. ISBN 0-813-12461-1. ↑ Maltin, Leonard (1972). The Great Movie Shorts. Crown Publishers. p. 145. ↑ Doherty, Thomas Patrick (2013). Hollywood's Censor: Joseph I. Breen and the Production Code Administration. Columbia University Press. pp. 1864–1865. ISBN 0-231-51284-8. ↑ "Following In Their Parents' Footsteps". The Sydney Morning Herald. July 6, 1937. p. 9. Retrieved January 13, 2013. ↑ "Pete Smith Weds His Secretary". Daytona Beach Morning Journal. October 22, 1962. p. 1. Retrieved January 13, 2013. ↑ "Pete Smith". Associated Press. Toledo Blade via Google. January 14, 1979. Retrieved 2012-01-30. ↑ "Leap From Roof Kills Former Filmmaker". Daytona Beach Morning Journal. January 14, 1979. p. 4B.